P.A.R.C.S. 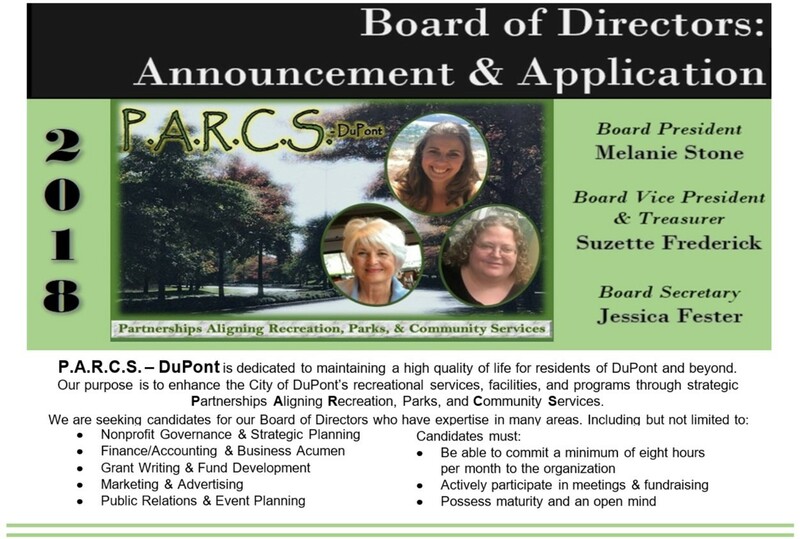 - DuPont is dedicated to maintaining a high quality of life for residents of DuPont and beyond. P.A.R.C.S. - DuPont is seeking volunteers that can spend some time working on various projects helping fulfill our mission. We are looking for mature, like-minded individuals, willing to give their time, skills, and enthusiasm to serving on our Board of Directors or as Committee Leads, as well as special project volunteers. All skill levels, services, individuals, and organizations are welcome to join us! If you are interested in learning more about our nonprofit, what we intend to do for the City of DuPont and its residents, who we are, and how YOU can be a part of the next great phase in our City's development, come and join us!